A Sweetwater police officer has been arrested for his involvement in a 2015 crash. 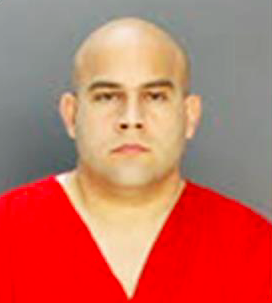 Officer Alejandro Ramos is facing a charge of official misconduct by a public servant. In a video obtained by Miami Herald news partner CBS4 last July, a Sweetwater patrol car rolled slowly through an intersection to get to a nearby police scene where officer back-up had been requested. Seconds later, the video shows a second cruiser blowing through the red light and colliding with an oncoming pick-up truck on Flagler Street and 107th Avenue. A written report from the Feb. 17 crash states Ramos stopped at the red traffic signal, which is Sweetwater policy. But according to American Traffic Solutions, Ramos’ patrol car was going 50 mph in a 40 mph zone. Dumbass. If he wouldn't have lied about it he probably would have only been written up and suspended a few days. Yup. Around here that would probably get him 15-30 days off depending on his driving record, unless it was really bad, in which case he could get the axe-----but the axe ain't arrested, it's just the axe. The 24 hour news cycle I'm sure has nothing to do with it. Reminds me of the two NYPD guys who got caught on camera fleeing the scene of an accident involving the guy they were chasing. Best part was the camera that caught them was a NYPD camera. He should be forgiven. He was running code for thr betterment of the tribe. If you can't be truthful, a cop job just isn't for you, might I suggest politician instead as they are expected to lie. LOL... In my experience lying on your police report seems like standard procedure.